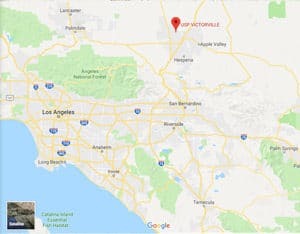 Facilities: FCI Victorville Medium 2 with an adjacent minimum security satellite prison camp. Location: FCI Victorville Medium 2 is located in San Bernardino County, approximately 85 miles northwest of Los Angeles, on Interstate 15. Background: FCI Victorville Medium 2 and the satellite camp were opened in 2004. The camp is located adjacent to, and provides support services for, FCI Victorville Medium 1 and 2. The facilities are part of the Victorville Federal Correctional Complex (FCC). Notable inmates include Mohamed Osman Mohamud (serving a 30-year sentence for attempted use of a weapon of mass destruction), former leader of the now-defunct Sonora Cartel Miguel Caro-Quintero (serving 17 years for drug trafficking), and reality TV star Abby Lee Miller (serving a 366-day sentence for bankruptcy fraud). Housing: Inmates are housed in two-person cells. Inmates in the camp are housed in dormitories, which are divided into two-person cubicles. Health Services: Emergency medical care, sick call, physical examinations, annual TB testing, medication, dental services, and eyeglasses are all provided at FCI Victorville Medium 2. Inmates must submit a triage form in order to be evaluated for routine care concerns. Emergency medical care is available 24 hours a day by approaching any staff member. Psychology Services: Intake screening is provided for each inmate upon arrival at FCI Victorville Medium 2. Inmates can also speak with a psychologist briefly during open house hours or at main line. Psychologists also conduct various groups and workshops for inmates. These tend to include stress management and anger management. A self-help library is also available. Suicide and other crisis counseling is available 24 hours a day if an emergency exists. The camp also offers the STAGES Program for inmates with serious mental illness and personality disorders. Residential Drug Abuse Program (RDAP): FCI Victorville Medium 2 does not house a Residential Drug Abuse Program (RDAP), but referrals can be made to institutions which do provide RDAP. The institution does offer Alcoholics Anonymous (AA), Narcotics Anonymous (NA), a Drug Education class, and the Non-Residential Drug Abuse Program (NR-DAP). Education Services: FCI Victorville Medium 2 offers literacy, GED, and English as-a-Second Language (ESL) programs to inmates. Both parenting and Adult Continuing Education (ACE) programs are also available. Coastline Community College enables inmates to obtain an Associate’s Degree in either liberal arts or specialized business. High school diplomas and post-secondary programs are available through paid correspondence programs. Advanced Occupational Education: FCI Victorville Medium 2 offers advanced occupational education in Automotive Service Excellence, Bicycle Repair, Horticulture, Microsoft Office 2010, Recycling/Solid Waste Management, ServSafe, and Solar Panel Installation. The camp offers Automotive Service Excellence, Horticulture, Microsoft Office 2010, Recycling/Solid Waste Management, ServSafe, and Wheelchair Repair. Vocational Training: FCI Victorville Medium 2 does not offer any vocational training programs. Apprenticeship: FCI Victorville Medium 2 offers apprenticeships in Plumbing and HVAC. The camp offers an apprenticeship in Dental Assistant. Library Services: A leisure and law library is available for the inmate population. Inmates can check out a wide variety of books, magazines, and newspapers. Books can be checked out for two weeks at a time. Inmates are provided access to legal materials and an opportunity to prepare legal documents through the use of the TRULINCS Electronic Law Library. A copying machine is available to reproduce materials needed for research. Electric typewriters are also available for inmate use. The library is open six days a week. UNICOR: The FCI Victorville Medium 2 UNICOR facility handles vehicle management and vehicular components. Commissary: Inmates have the opportunity to purchase items not issued or delivered as basic care by the institution or items of a different higher quality. The monthly spending limit is $360.00. Inmates are allowed to shop once a week on their designated shopping day. Copy cards, postage stamps, and over-the-counter medications do not count against the spending limitation. Inmates tend to carry their purchases back to their housing units in laundry bags. Recreation Services: The FCI Victorville Medium 2 Recreation Department offers a variety of indoor and outdoor activities for the inmate population. Inside, inmates can participate in arts and crafts programs. Outside, inmates can work out, play sports, take fitness classes, or socialize. A photo program is also available which allows inmates to have their photos taken.